It's official, our pool is closed for the season and I am in the mood for Fall now. I don't sound like I am very excited about that, but I am, really. Besides it was in the upper 80's last week and now it's barely 60 today, umm yeah, bring it.....Mr. Weather Man!! You watch we'll have an Indian Summer soon and it will feel like summer again. Craziness in the Midwest! So I thought I better get moving on taking down summer, but here's one last look at my summer mantel and all the great memories that are still fresh in my mind. Goodbye summer, see you in about 7 months. Since my fireplace is mammoth with a ton of red brick, I needed to break it up a bit. 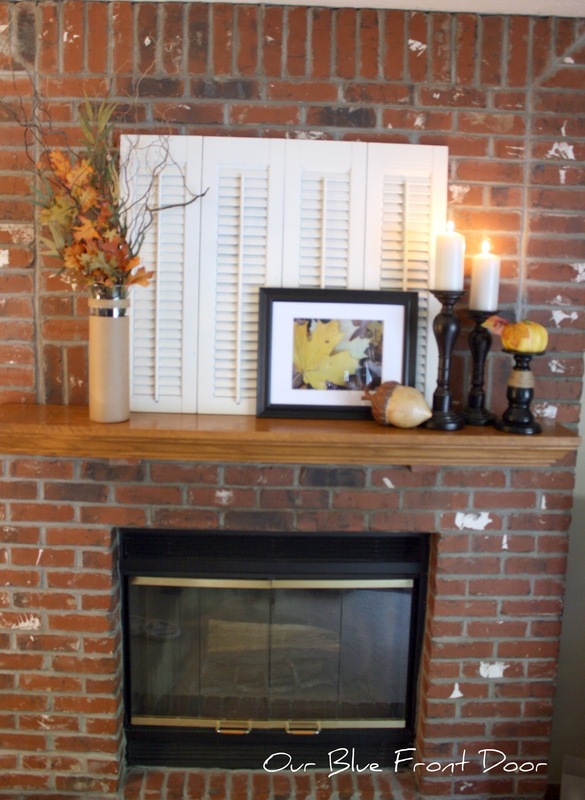 Someday I am going to paint my fireplace like Ann's beautiful fireplace. 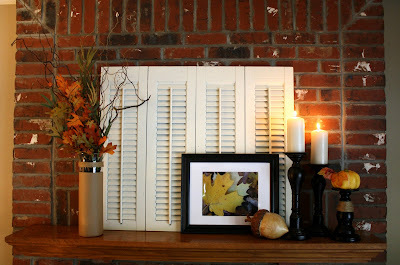 Until then I use these awesome shutters as a back drop from our local architectial salvage yard. I gave them a fresh coat of paint and they were ready to go. I took this picture last fall in my back yard and thought it would be perfect in a frame for the mantel. Plus, I've been into "yellow" lately, not sure why but just liking me some yellow! 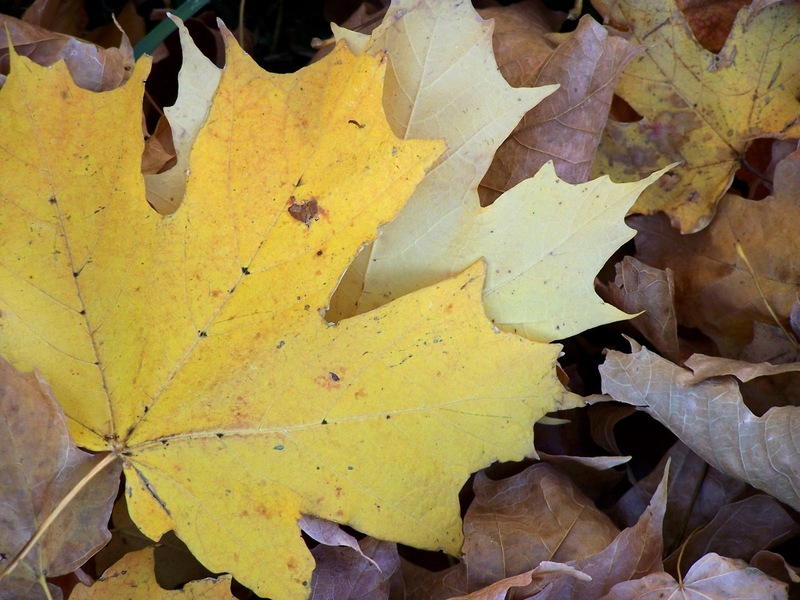 Are you getting ready for Fall at your house? I love your mantel Andrea! The little pumpkin on the candlestick is so cute. I am getting in the mood for fall too. It has felt like fall the past few days here. You're right about the crazy weather in the midwest. It can be 60 one day and 80 the next!! That print is perfect for fall! 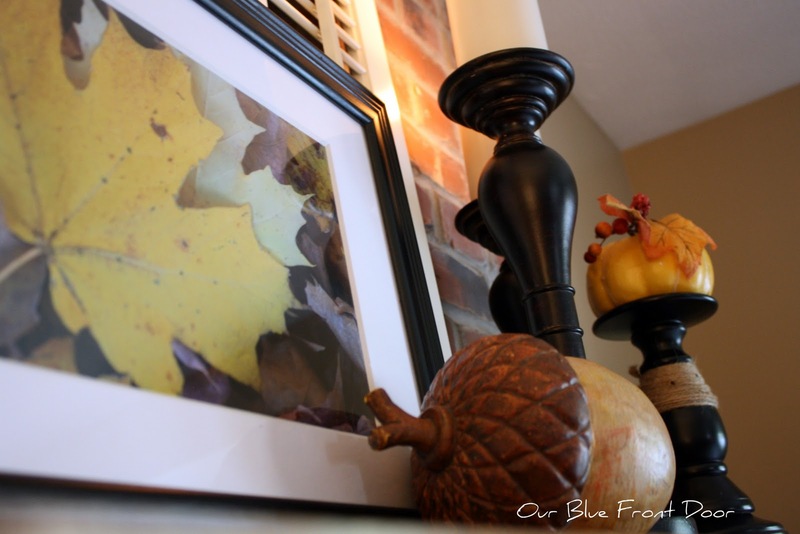 Don't you love it when you can use your own photos for decor?!? Andrea, it looks gorgeous....so cozy! That is such a brilliant idea to take a picture of fall leaves and frame them! I have to get my act together and change for the seasons...I think you just gave me the motivation I needed! Great print, Andrea! And I love the little acorn!! Hi Andrea...you are ready for Fall. I love your shutters and all your Fall touches. Thanks for joining my newbie party. Andrea, your mantel is so beautiful! The photo you took is absolutely gorgeous! So glad I stopped by for a visit from Debbie's Newbie party! Looking good...love the big acorn and the shutters! love that huge acorn! your mantel looks fab.